Bordado, as we found out in Seville, is Spanish for embroidery. The Folk Museum had lots of really interesting artifacts all housed in the beautiful Moorish Pavillion. 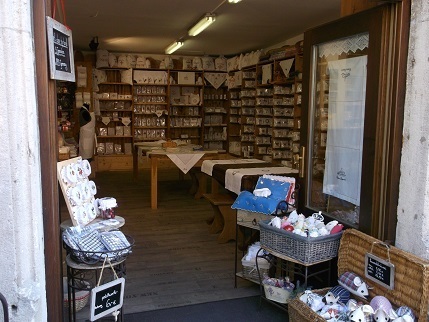 The first section we looked at was devoted to materials and their transformation and there were lots of displays of all types of artisan workshops including gilding, woodwork, leather and bakery. 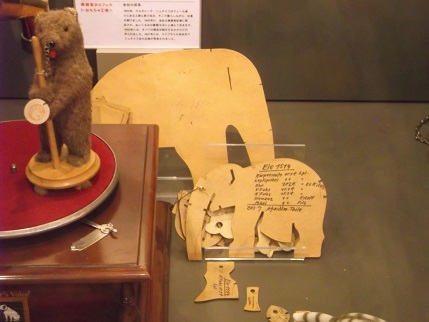 There were also some brilliant works in progress pieces, one of the most exciting things for me in museums is seeing the unfinished pieces so you can see how they have made the embroidery. 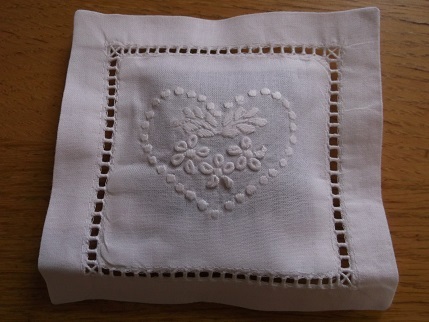 In these pictures you can see the whitework paisley before the holes are cut and where padding stitches have been done first before satin stitch. 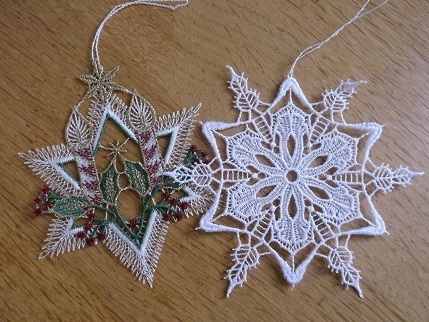 There is also the lace being worked over a paper pattern. I was really interested to see the tissue paper pinned round the working area on this last piece to keep it clean. That is something I haven’t done but is a great idea. The embroidery frames are beautifully made as well. Then to my great excitement there was a whole gallery of embroidery and lace, one of the biggest collections that I have ever seen, so much wonderful work. 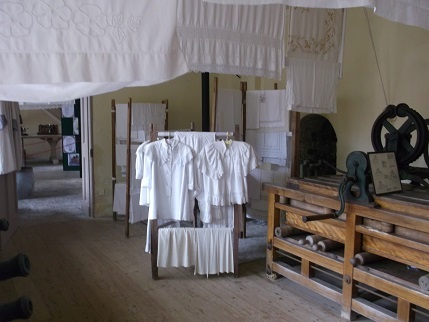 Much of it was a very similar type of work, sets of tray cloths or table cloths and napkins all unused and very similar in design. 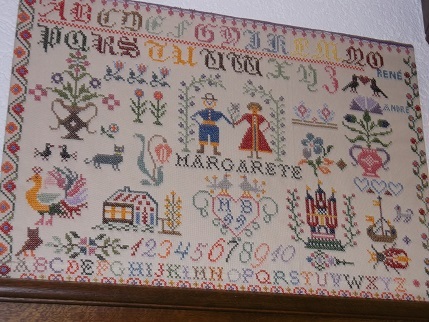 I wondered if they had been sample pieces for a book on embroidery or a series of magazines.I would guess they may be from the late 20s or 30s looking at the designs, there was no information about their origins though. 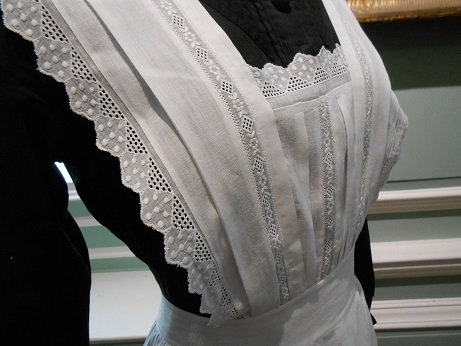 There was also very detailed whitework, some with cutwork lace. 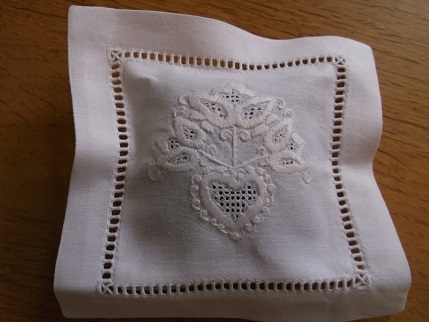 I have never done any whitework though have some books on it and would love to. 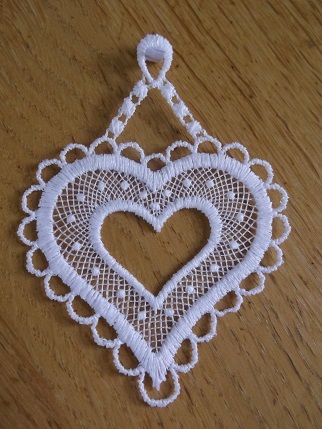 I don’t think I could ever make lace though I love looking at it. 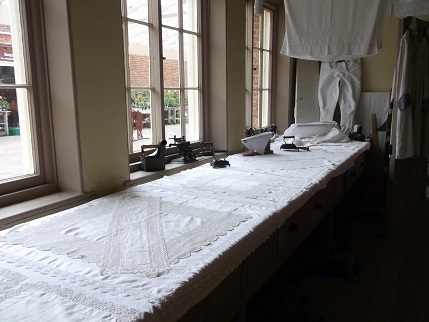 One of my favourite pieces of whitework was this amazingly detailed unfinished tablecloth, you can just see the pencil outline of the rest of the design on the right. Things like this always make me want to know the story of the maker, what happened, was it boredom and it became a WIP? Was there a tragedy and she never finished because of this? 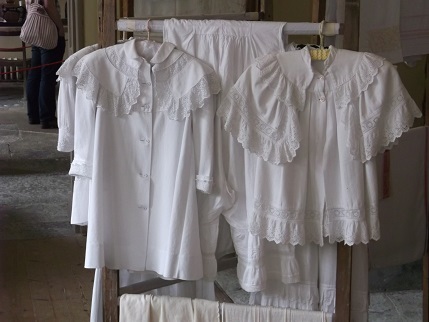 There was also lots of amazing Spanish lace, whenever we go to the Easter Parades we admire the beautiful lace mantillas that the women wear with the high combs and these were stunning examples of mantillas and shawls. When we at the recent fiesta in Alicante there were a group of people in costume with mantillas and lace aprons, it was too crowded and dark to get pictures then but these are a couple from Google from previous year’s fiestas to show you how beautiful they are. 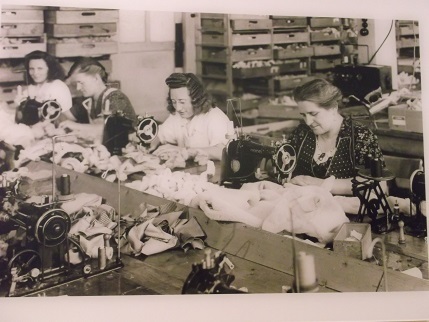 Spain has such a wonderful history of textile crafts and I love these traditional costumes. I am still working on Jenny’s embroidery sampler at the moment and having fun practising stitches I have not done for a while like chain stitch. I still can’t master French Knots so may have to substitute seed beads. I have a nice week ahead as I am working from home all work which means lots of early finishes and sewing time. We might even get some more BBQs in, only 7 to go to hit our target of 20. Hope you are also going to have a lovely week, take care and thanks for visiting. 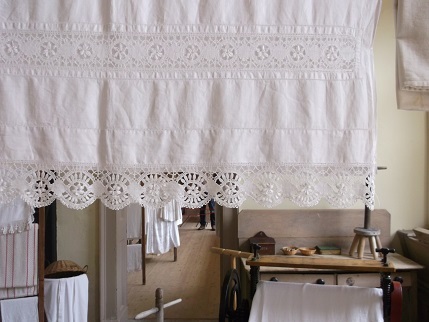 One of my favourite parts of the Oslo Folk Museum of course was the exhibition of traditional folk costume, the bunad, and some wonderful examples of the embroidery including Hardanger, a traditional type of whitework from Norway. 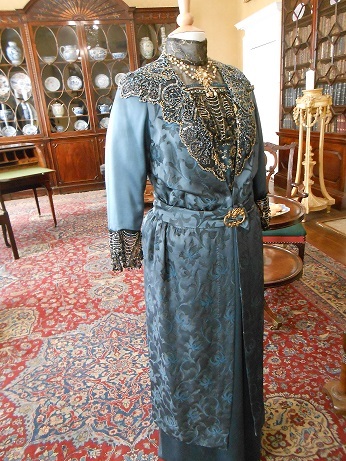 There were examples of wool embroidery on costumes and accessories. These baby’s caps were a combination of wool and redwork embroidery. There was also blackwork, excuse the fuzziness of the picture below but I wanted to show you amount of stitching on this beautiful head dress. We also saw a bridal outfit like this one below and lots of the beautiful jewellery that is worn with the costume. There are more beautiful images of Norwegian bridal crowns here , it really struck me how much the head dresses and the silver jewellery resembled the Miao Chinese folk costume that I saw when I went to the Ethnicities Museum in Beijing. We saw quite a few people wearing their traditional costume on Christmas Eve in Oslo, particularly in the cathedral where we went for the afternoon service. 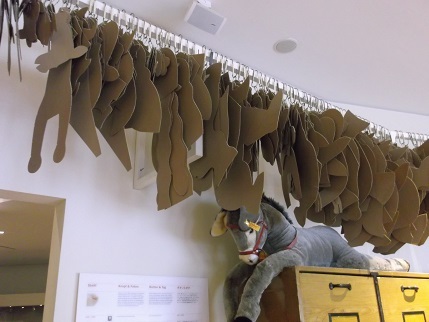 This website has got lots of photos of people wearing their bunads at an event held at the Folk Museum in 2012. 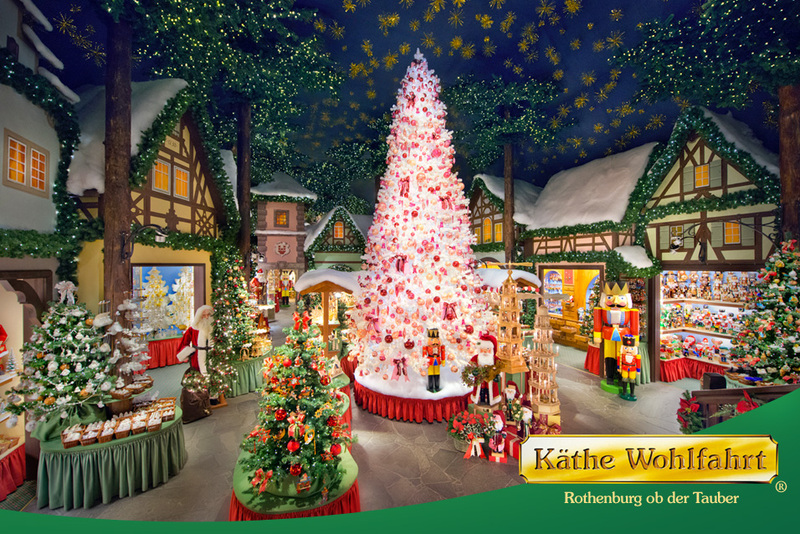 They were also on sale in one of the department stores, with packs of ready prepared shirt material and embroidery patterns. I was also very pleased as many years ago when we visited Sweden I bought some beautiful metal clasps that I have used for medieval costume. I only have this one left. But I discovered that they are used in the bodice of the bunad so was able to buy some more sets, I now have two each of these beauties. And if you want more information and pictures about the wool embroidery this is an excellent source looking at costumes from Northern Norway. 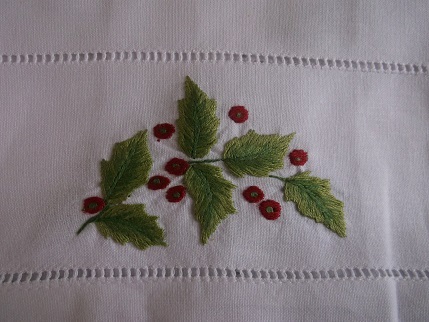 Well I will leave you know and get on with some actual embroidery rather than just adding to my to do pile! Will be back soon with the last of my Norwegian loveliness posts. Have a lovely rest of the weekend and thanks for visiting. Hope that you have all had a good week. It has been a busy one for me and very little crafting is being done at present, partly due to the start of term but also I am trying to rest my wrist as I still have a problem with tendonitis which is quite painful. 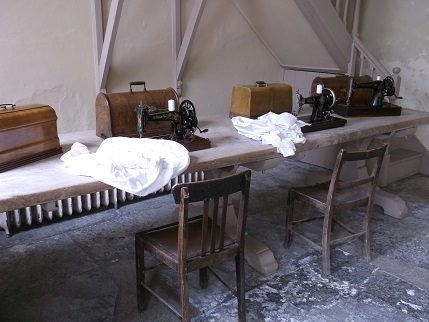 However I have lots of photos from trips out over the last few months, mostly involving lovely textiles so I thought we could look at some of those over the next few posts instead! Sharon and I recently visited Cannon Hall House and Gardens. We used to go there a lot when the kids were little as they have an excellent farm but had never been in the house. 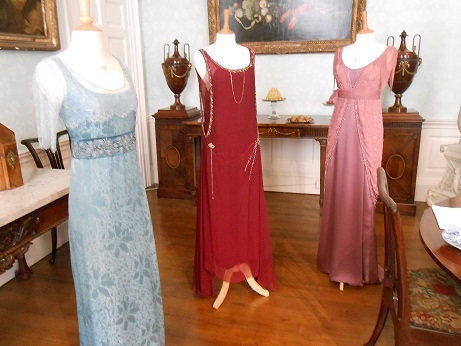 The reason for our visit was an exhibition of costume from the Downton Abbey TV series. 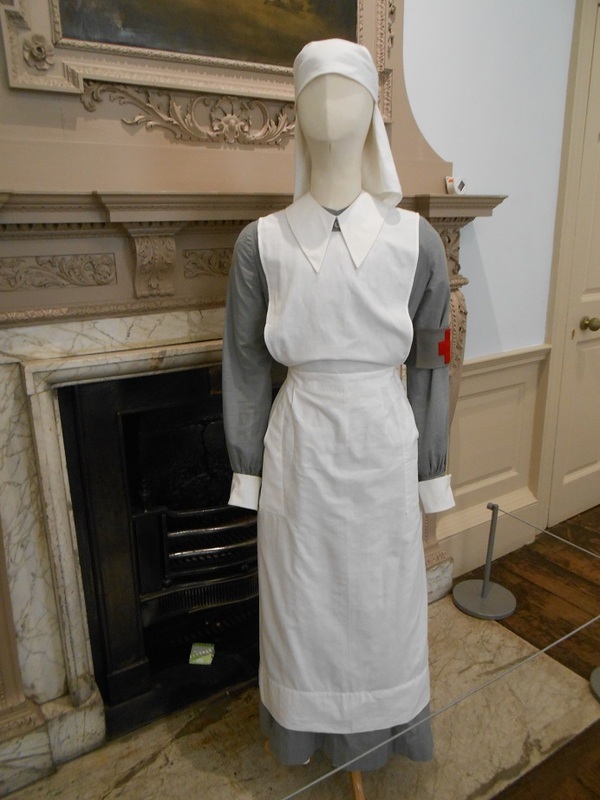 There were some really lovely pieces, starting with some of the very simple outfits worn by the cook and Lady Sybil in her role as an Army nurse. But then they got more elaborate. It was lovely to see them in the room settings with the all important afternoon tea laid for Lady Violet, I did love her character, she was so witty with her put downs! The daughter’s costumes were beautiful, but they were all so tiny, they must have only been size 6 or 8. 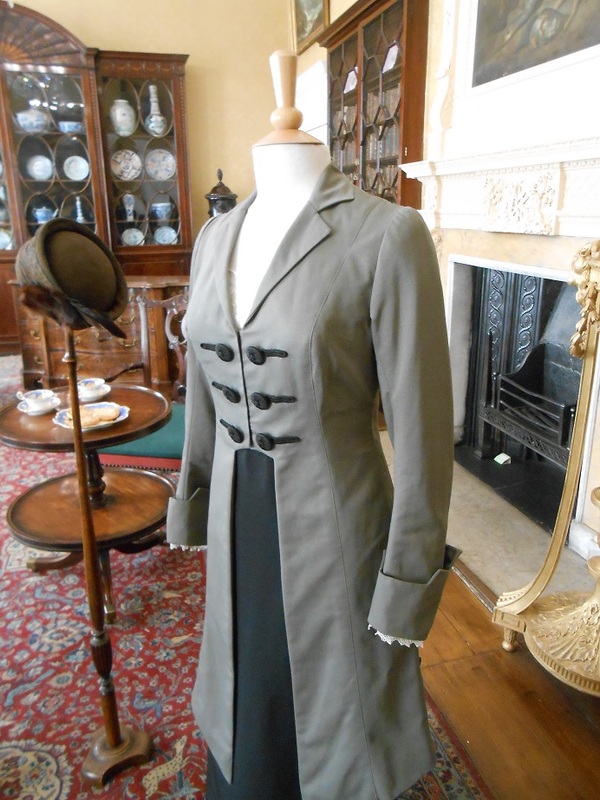 Two of these ones in the drawing-room were made for the series. 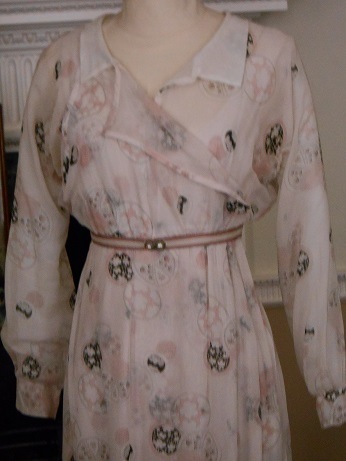 This one was an original 1920’s dress and was worn by Lady Sybil in the series. 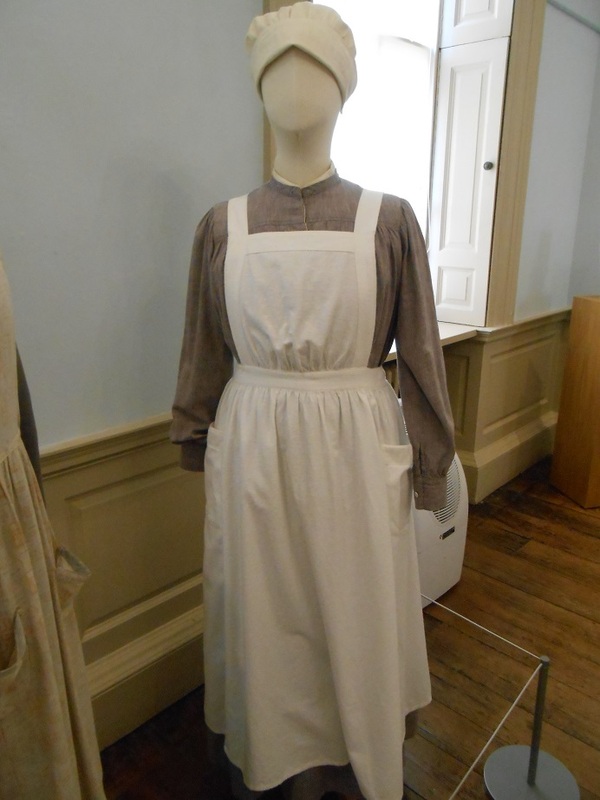 Though the below stairs costumes were very plain the housemaids who would be in the family rooms had some pretty detail on their aprons. 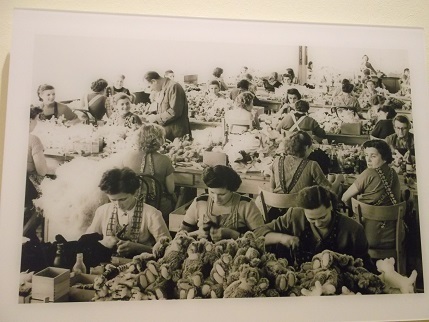 And for serving dinner they had lovely black dresses and lace aprons. 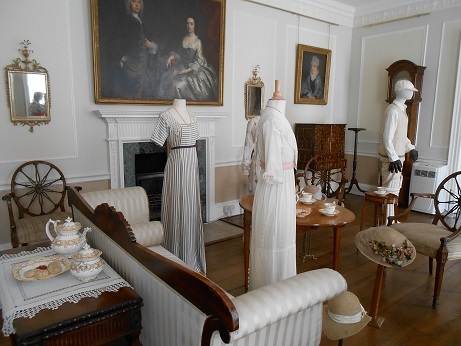 Though nowhere near the glamour of the dresses worn by Lady Sybil, Lady Edith and Lady Mary. I love these, ‘new fashion, looser more unstructured gowns. 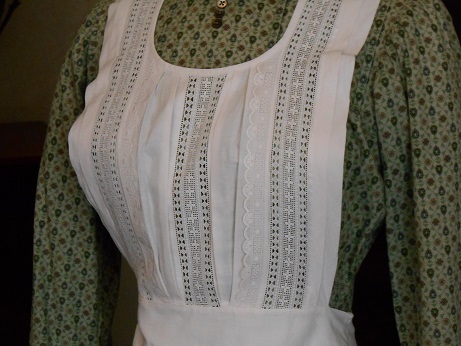 Having worn corsets and very restraining dresses in my medieval roles I can really appreciate how the women must have felt to be able to wear this rather than the Edwardian costume of their parents and grandparents. 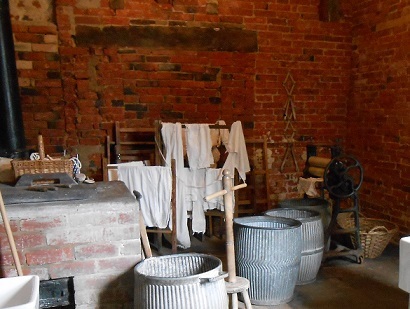 I always love seeing the laundries at old houses as well, when I was little my grandmother had a tub with a mangle, it did plus in so the water was heated by electric but I used to love using the mangle! Sharon and I ended the day with visits to a couple of garden centres and of course some afternoon tea and cake! Meanwhile I shall content myself with organising Crafternoon Teas for my friends – we have another one coming up in a few weeks so chance to get the cake stand out again. Hope that you have a nice weekend planned, take care and thanks for visiting. 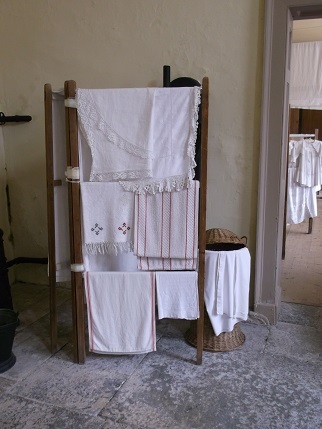 One of the parts of our visit to Kingston Lacy that I most enjoyed was seeing the laundry which they had furnished not only with the equipment used but also examples of the textiles as well, very exciting for me! 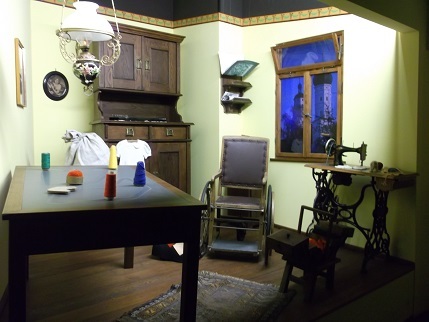 The house dates from the 1600s but the display was of the Victorian machines and textiles. 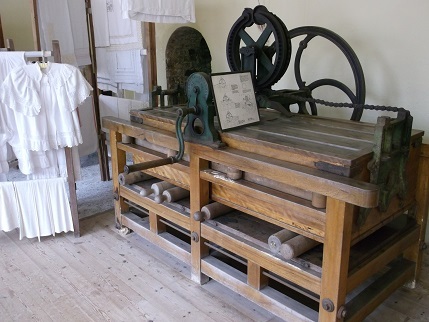 I love this huge roller mangle, I remember my Mum and Nana having washing machines with mangles on top when I was little and really loved having a go, would not have been so exciting to be a full-time laundry maid though. The drying cupboard was very interesting as well, I assume many large houses might have had something similar but have not seen one before, these racks slid into the cupboard which had heated pipes on the floor. 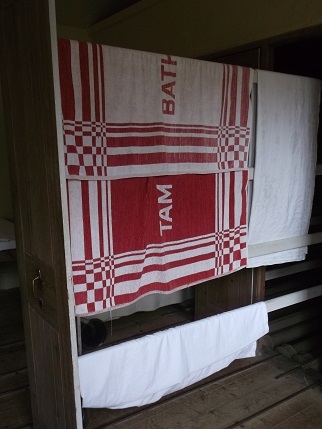 I also found some lovely textiles in the main house – what a surprise! Will save that and pictures of the house for the next post.